A pond is a stationary body of water made by man for recreation, landscape or other such purposes. A turtle pond is a pond that mainly houses various kinds of turtles and vegetation that supports turtles. A turtle pond has certain features that are different from a regular pond. One side of a turtle pond has to steep on one side, and the other end should be shallow, with a gradual slope that makes it easy for the turtle to climb. The steep area is usually towards the back of the pond. Turtles are semi-aquatic creatures, meaning that they need to come out into the dry area and bask in the sun's light at least for a few hours every day. The turtle pond has to provide well rounded stones that will help the turtle climb out of the pond without damaging itself. When the turtles are young, it is necessary to keep the pond shallow. The depth of the pond should only be about as much as the length of the turtle. Care should be taken that there are no wedges within the pond that the turtle will get stuck in. 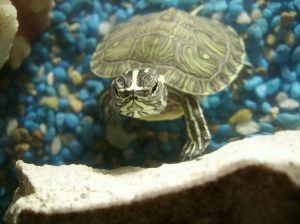 Liner ponds or pre-formed turtle ponds can be used to house your turtles. Pre-formed ponds are of course costlier and less flexible when it comes to shape and design. A pond that is used mainly for water turtles should realistically be about 50-500 gallons and should have a variety of depth levels, so that the turtles can swim and rest. Aquatic turtles need to feel the earth beneath their feet. Whether these are on smooth rocks, sandy surfaces or on logs that stick out of the water, the turtles need a dry area in the turtle pond. Furthermore, the female turtle looks for a dry area when it is time for her to lay her eggs. It is probably a good idea to have some kind of fencing around the turtle pond, especially since turtles will run away without it. The fencing will also keep predators away especially when the turtles are young. Wire fencing is a good option. But the wire has to be dug deep into the earth because turtles tend to dig, especially as they age. If fencing is expensive, providing a sheer drop on the one side of the pond is also effective. This can be achieved by using rocks. Leaving the turtle pond only half full by digging it a little deeper than necessary also ensures that the turtles cannot get away. A turtle pond also needs a large number of hiding places. This also allows the turtles to move from cooler to warmer depths according to their needs. On an especially sunny day, they may prefer to use some shaded areas. Thick vegetation, flower pots, rocks can all be good hiding places. Turtle ponds require filtration just as common aquariums do. Pesticides, ammonia, nitrites, nitrates and pesticides are some of the common compounds that turtles need to be protected against. Turtles will be doing most of their defecation as well as their feeding directly in the turtle pond. Turtles are messy eaters. That means loads of waste in the turtle pond. Changing 10-25% of the water twice a week with an eye on the temperature fluctuations is the better way to control water quality. During the winter season, care should be taken to keep the temperatures up. Turtles will leave off eating if they feel cold. Use of fluorescent lighting to regulate temperatures, and altering the intensity of the lights with a timer to simulate the sun are all part of good turtle pond care. Using pond plants is another good idea while building a turtle pond. Pond plants act as natural filters. They will also provide good hiding places for the turtles. But care must be taken while selecting the plants. If the turtles are predominantly vegetarian they may develop a taste for the vegetation around them. Pond fish - An introduction to suitable pond fish.